While the 1980's brought us high-revving, multi-cylinder motorcycles with 10,000 red-lines, the Harley-Davidson Sportster was still getting it done at 5,500 rpm. Accelerating anywhere above 2,000 rpm, down-shifting was not really necessary. A twist of the throttle and the 1,000cc V-twin responded with all the torque you needed. With the XLCH model discontinued in 1979, there were no more kickstart Sportsters. All models were now electric-start. This allowed room to move the rear master cylinder down and out of the way of the rear exhaust pipe. For 1980, Sportsters continued using the triangulated frame introduced with the 1979 models. In a mid-year running change, Harley-Davidson improved the Sportster's intake manifolds and clamps. Cylinder heads were modified to help improve sealing and avoid vacuum leaks. The Sportster XLS Roadster featured a Super-Glide gas tank. A 16" rear wheel replaced the XLH 18" wheel. To help prevent accidental throttle sticking, a double (push-pull) accelerator cable was added. A new electric starter and drive were fitted, and an electronic tachometer replaced the cable-driven unit. 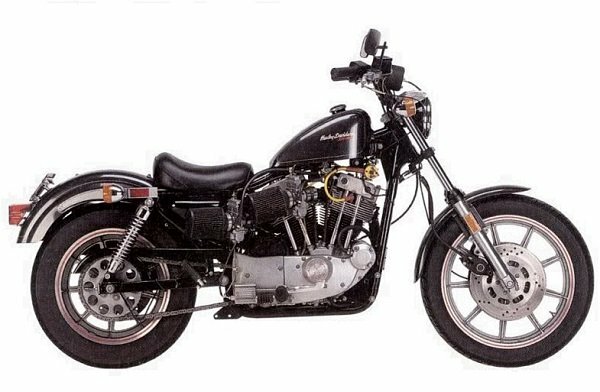 The Sportster's electronic ignition was replaced by a Magnavox unit, which used an inductive pickup to send signals to a timing control module. Called the V-Fire II, this module is often referred to as the "black box." Among other changes, 1982 models were fitted with a stronger and lighter frame. This allowed the battery and oil tank to be repositioned. New handlebar controls were welcomed, along with better quality wiring. Although the new gear-reduction starter proved more efficient on the 1982 Sportster, it required removal of the primary cover to service. Crankcase castings had modified to accommodate it. To comply with federal emission regulations, engine compression was lowered from 9.0:1 to 8.8:1. This was achieved through use of slightly thicker head gaskets. The Ironhead would now run safely on lower octane gasoline, but it also decreased horsepower and top-end speed. From 1982 to early 1984, the Sportster was equipped with a "65B" generator. It was Japanese-made and shared no parts with earlier generators. The early "65A" generators will fit on these later-year models. Celebrating 25 years in production, the 1982 XLH and XLS Sportsters featured special anniversary trim in silver and black. 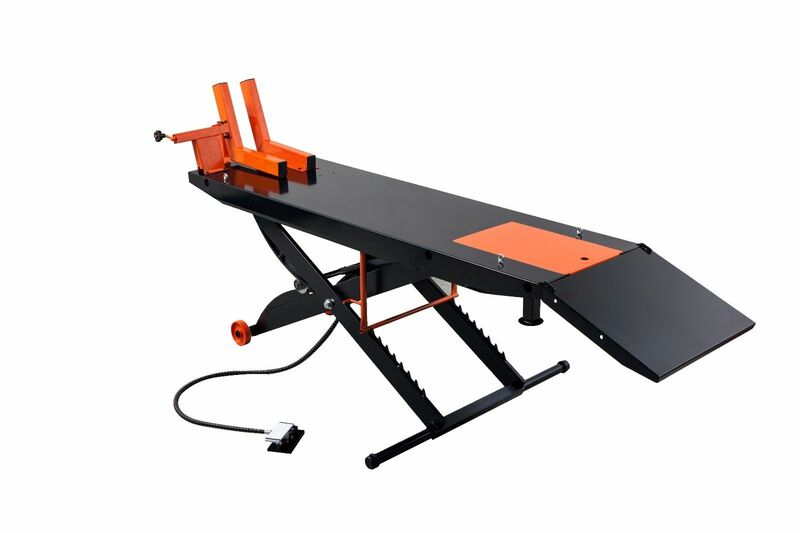 A limited number of orange and black models were also offered. This year saw a new seat and less restrictive exhaust system. 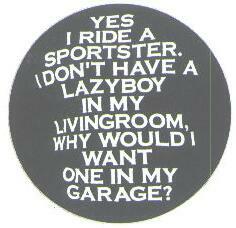 Sportster buyers had an option of having a larger 3.3 gallon tank. Late 1983 saw the emergence of the V-Fire III ignition. It is often referred to as VOES, an acronym for "Vacuum Operated Electrical System". 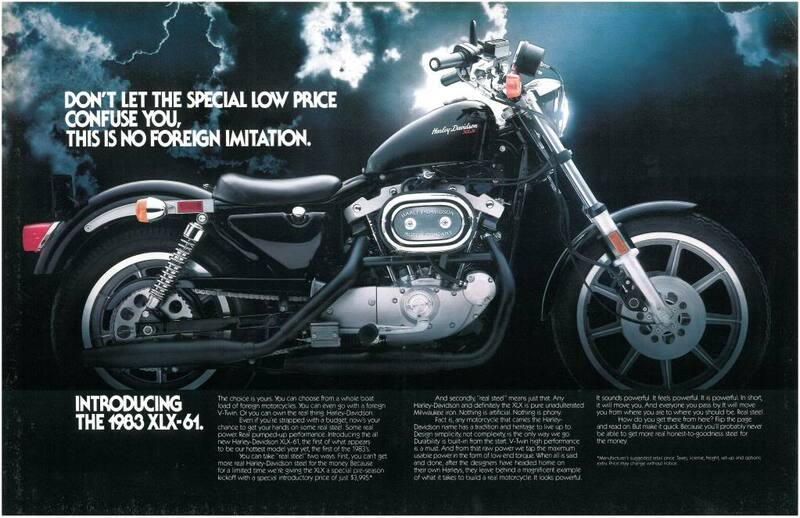 Clearly one of Harley-Davidson's great marketing moves, the entry level, no-frills XLX61 Sportster was offered in 1983. This bare-boned machine came with a solo seat, peanut gas tank, and single (speedometer) gauge. Built to sell for $3,995, it was available in black only. In its first year, 4,892 XLX61 models were sold, more than all of the other three Sportster models combined. 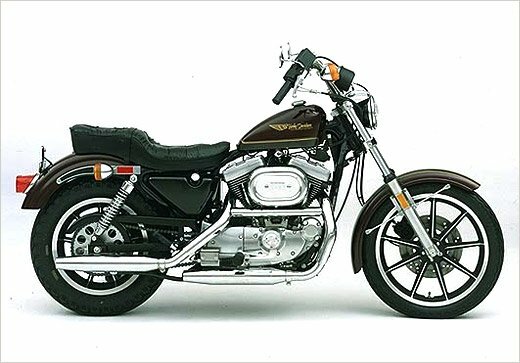 The XLX is one of the best-selling models in Sportster history. As a tribute to the flat-track successes of the Harley-Davidson XR750, the Motor Company offered the limited-edition XR-1000 Sportster. The XR cylinder heads, specially prepared by Jerry Branch, were all-alloy and featured bigger valves than XL Sportsters. To accommodate the larger valves, intake ports were moved to the right side and exhaust ports were on the left. Because the XR cylinder heads were larger than the stock cast-iron heads, the cylinder barrels were shortened to fit into the Sportster frame. Other features included 9 spoke cast wheels and a 2.5 gallon gas tank. A pair of 36mm Dell'Orto carbs brought power output to 70 horsepower, dipping quarter-mile times under thirteen seconds. Dual eleven-inch front brake rotors supplied the best stopping power yet. The XR-1000 weighed in at 490 pounds. Top speed was about 125 mph. In mid 1984, an alternator finally replaced the generator. Trouble was, it was placed behind the clutch, making it difficult to repair. This troublesome design was not corrected until the 1991 Evo Sportster. With production trimmed in anticipation of the new aluminum-head Evolution engine, less than 7,000 Sportsters were built in 1985. The Ironhead Sportster, arguably the loudest and meanest-sounding V-twin ever, enjoyed a 28-year production run. Long live the Ironhead!